Got an email last night about the expiration of the Emergency Unemployment Compensation (EUC) program on December 29, 2013. I am officially screwed. As is everyone else collecting extended benefits. Laura Schlegel, a mother and active community member in Portage Park, Chicago, is facing eviction by the Cogsville Group, a private equity firm in New York City. The family is one of thousands of families now renting homes owned by massive private equity firms and hedge funds. Capitalizing on the foreclosure crisis, these Wall Street investors have purchased 200,000 homes across the country -- mostly in cities hardest hit by the foreclosure crisis. Laura is struggling with chronic pain due to nerve damage and needs to be close to her doctors in Portage Park. She could be evicted any day, and she has nowhere for her, her son and her dogs to go. Instead of putting them out on the street, the Cogsville Group should at least offer her and her family a new lease that allows them to stay in the home they previously owned. 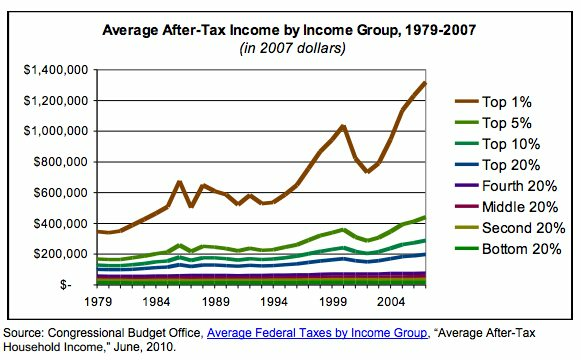 As the banks enjoy record-breaking profits and the 1% steal a bigger share of annual income than ever, the 99% have learned that this so-called economic recovery is nothing more than a big fat lie. Tens of thousands of people are still being evicted each month through foreclosure, and now private equity firms and hedge funds are executing a massive land grab in cities across the country. 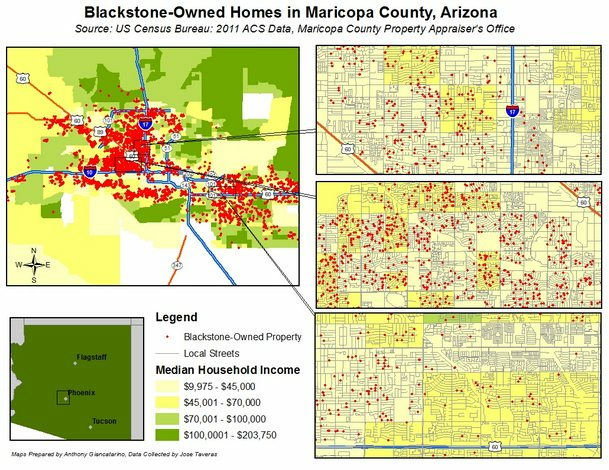 In some cities, like Phoenix, there are already Wall Street-owned homes on every single block by the hedge fund Blackstone. These Wall Street hedge funds and private equity firms are pretending to help by renting out these vacant houses -- but we know that they are just trying to make more money off the banks of the 99%. One of these private equity firms has even released a new risky security backed by rental payments -- which is just like the mortgage-backed securities that destroyed the economy in 2008. The story of Laura and her family show how we must stop this land grab and demand that housing be enshrined as a human right, not a means to make a short-term profit. 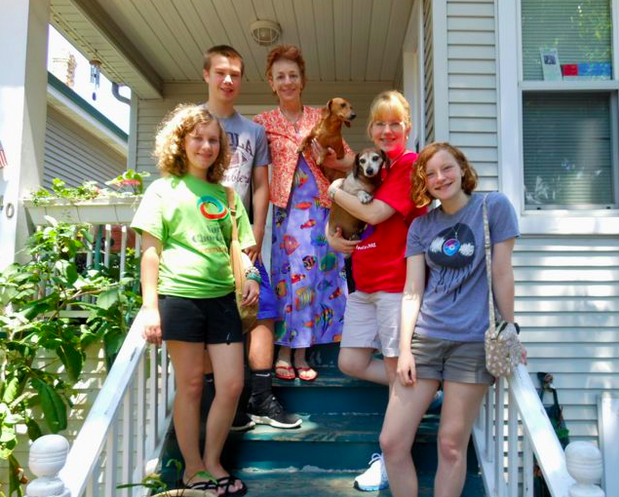 Laura, her son and 3 small dogs have lived in their Portage Park home for the last seven years. With the help of a partner, she bought the home in 2006 for nearly $400,000. After the market crashed, they attempted to refinance the mortgage. Following the bank’s instructions, Laura and her partner missed three months of their mortgage payments to qualify for a loan modification. But instead of working with the family, Bank of America put the home in foreclosure, using the highly controversial process of “dual tracking” in which banks simultaneously put families in the process of modifying their loans and put the loan in the foreclosure pipeline. In Laura’s case -- as with so many other homeowners across the country -- the foreclosure process won. Her home was sold at an auction and bought back by the government-owned mortgage giant Fannie Mae -- which then allowed a private equity firm, The Cogsville Group, to buy the right to manage her house and collect rent from the family. But when her home flooded this past spring, the company did not help her with clean up, mold remediation or repairs. In efforts to pressure Cogsville to assume responsibility for its property management, Laura’s partner stopped paying the rent. But instead of negotiating under the circumstances, the family received an eviction notice. Laura and her family are asking that the eviction be dropped, and that the Cogsville Group offer Laura a new lease with an option to buy. 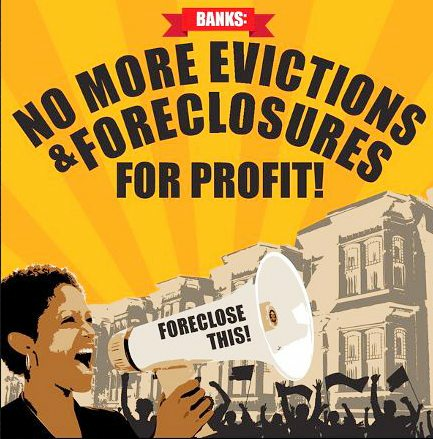 Help us stop Laura’s eviction -- and send a message to Wall Street that they can no longer exploit our human needs for their short term profits! Sign this petition to demand that Laura and her family are allowed in their home. 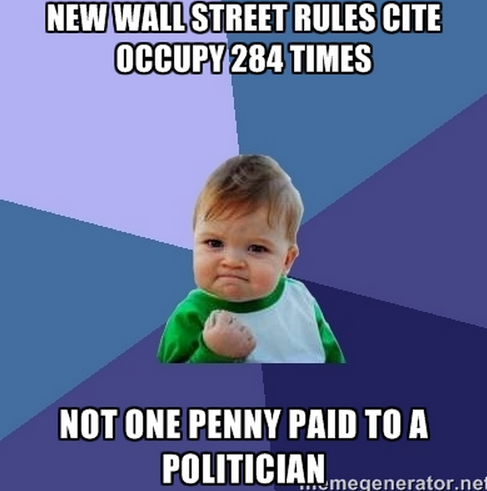 What if you could change the rules on Wall Street without bribing regulators or buying off politicians? Occupy the SEC, a working group of Occupy Wall Street, submitted critical public comment to SEC officials and followed up like crazy. "To get ideas, we had a weekly conference call where we talked about things with a couple other groups," added member Akshat Tewary. Making change. From the streets and in the halls of power. Train experience today - I was talking with my fellow commuters about the NY Post cover, we had a collective sigh and head shake over Mandela's funeral and the Post's front page image focusing on Michelle Obama's "jealousy" at Obama's "flirting." Right after that, a black dude walks in to do a speech. 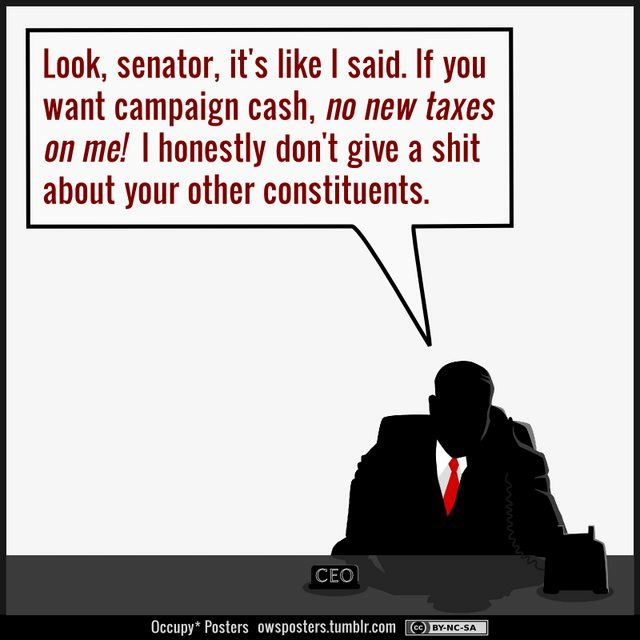 And he does not ask for money. He says he is speaking to get over his fear of public speaking, he says he's rich and does not need our money. He says that he is there to tell us that we all have a light, a greatness inside of us and we can all do grand things like end apartheid as Mandela helped to do. He said that we are all working jobs that strip away our souls and we need to seize that part back. Politics aside, we were a bunch of surprised commuters, the guts on this dude. Conversations evolved as people started talking about their inner painters, singers, playwrights, activists that we've ignored for our wage work. One dude said, "you know, I was in this car for a reason." 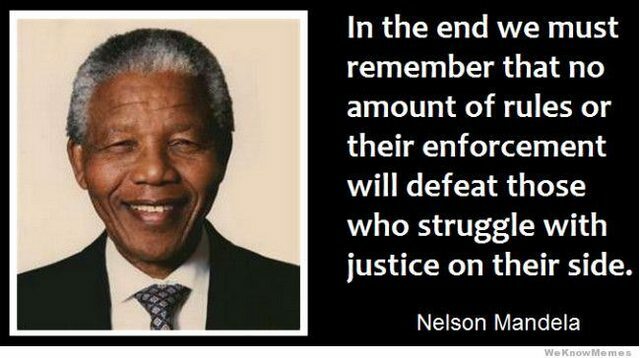 Now that's what I call remembering Mandela, when you can use a persons' life to remind us that we all got magic in our hands, even if we don't always use it as it should be used. Cynicism about Mandela is good, but today, I'm ok with me and my fellow commuters having a little glisten.